Popular West African hand drum originally played in Mali. 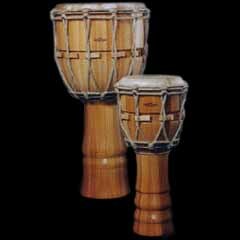 Similar to a conga, the hands can play in different areas of the skin to achieve bass tones, pops, open tones, and muffled sounds. The instrument pictured here was made in Canada by Mountain Rythym and features their unique "Simple Twist" tuning method, which allows for easy twisting of the ropes for tuning.